Recent efforts (supported by NOAA’s Climate Program Office) have allowed development of techniques for simultaneously measuring dissolved Sulfur Hexafluoride (SF6) along with CFCs in the same water sample. These techniques are now being used routinely as part of the CLIVAR/GO-SHIP Repeat Hydrography Program. Shown below are SF6 concentrations from the North-South transect A16 (2013) and the East-West transect A10 (2011). 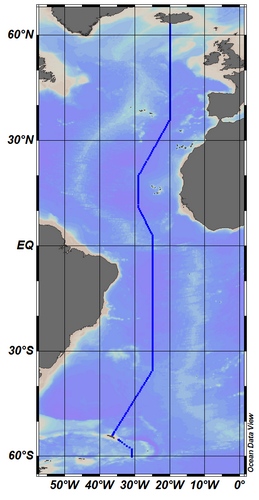 In addition to the input from the atmosphere, SF6 has been used as a tracer of diapycnal mixing rates in ocean by deliberately releasing the compound along selected isopycnal surfaces in several major ocean basins. The bottom maximum seen along the A10 section at about 30°S from 30°W to about 10°W in 2011 is due to a SF6 release experiment in 1996 (Ledwell, et al, 2000). 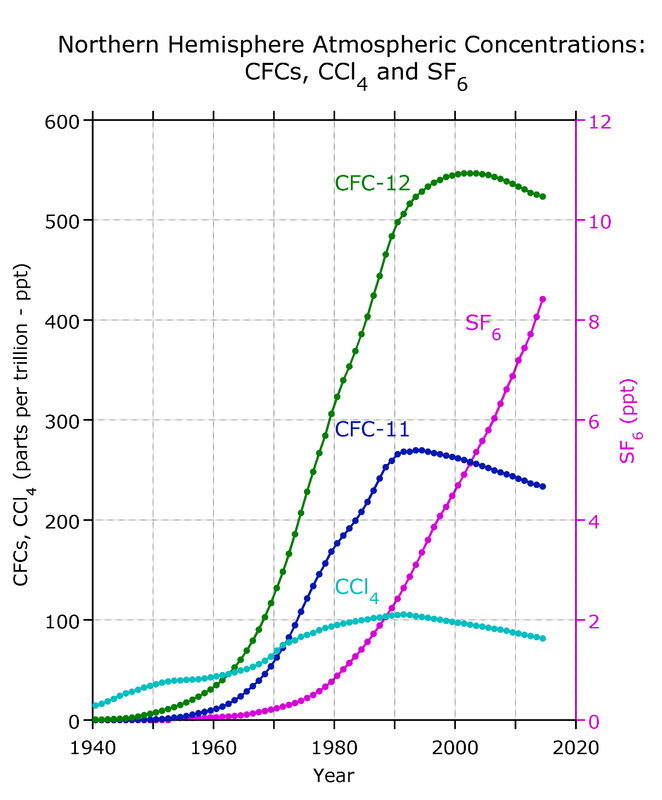 (C) The growth rate of SF6 and CFC-12 (shifted 14 years). Ledwell, J. R., E. T. Montgomery, K. L. Polzin, L. C. St. Laurent, R. W. Schmitt, and J. M. Toole (2000), Evidence for enhanced mixing over rough topography in the abyssal ocean, Nature, 403(6766), 179–182, doi:10.1038/35003164. Map showing CLIVAR A16 North-South Transect. Map showing CLIVAR A10 East-West transect.